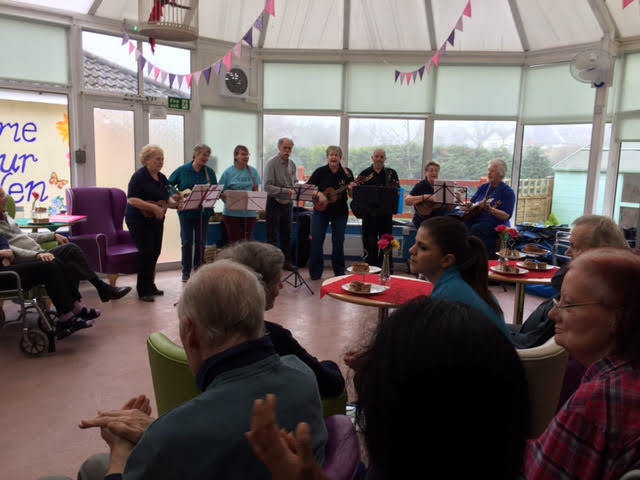 At Birchy Hill today we had the honor to welcome the Milton Ukulele Strummers Klub (MUSK), we enjoyed their unique tunes. The Residents loved the music! They were singing, clapping hands and dancing. Even the Residents in wheelchairs were moving to the entertaining rhythms. Sadly we had to say goodbye to the Band after an hour of fun, but we are looking forward to welcoming them back very soon. After a very happy afternoon we can now all rely on Queen Liliuokalani’s translation, believing the Ukulele being “A Gift From Afar”. 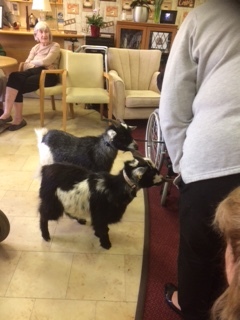 Orchid Care Home had another type of visitor at their Home this week. I bet you cannot guess what it could be! Well they got a Gecko, Fish, a Rabbit, 2 Guinea Pigs, and a Canary, so guess what else walked through their doors?………………………………. Every year all Staff put in lots of effort to make Nutrition and Hydration Week a success. 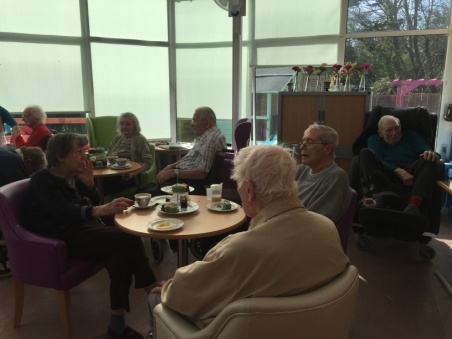 At Birchy Hill we started the week off with a Chocolate Fountain, this is where Residents loved this opportunity and enjoyed eating fruit and marshmallows covered in chocolate. (YUM YUM). Many asked to return it very soon. On Tuesday we went on a world tour with different teas. Most Residents loved the Indian Chai Latte and a Russian Earl Grey. Place 3 went to a flavored Chinese Green Tea. Then on Wednesday afternoon we joined the Global Tea Party with so many new cakes, where our Chef Sam created, just to name one “Smurf-Cake”. To round it up, our Nurse Ricardo played the piano and everybody joined in with singing to well known tunes. The Residents had so much fun, and we all loved that great feeling being part of a global challenge! Next day it was Smoothie time. I don’t have to say how much everybody loved this sweet treat. Nobody wanted to decide which flavor was the best. They all went too quickly. As Friday was also St Patrick’s Day, the whole day’s motto was Ireland. We decorated in and out with Irish symbols and flags and had an Irish inspired soup to our usual lunch. In the afternoon we welcomed Caryn Morant, who was singing to everybody’s entertainment. Care assistants encouraged the residents to dance and so many followed. It was wonderful to see everybody so happy. The kitchen spoiled us with a lovely Irish buffet and everyone tucked in. Carrying on with Nutrition and Hydration we had a marvelous fruity Saturday with lots of fruit many of our Residents hadn’t tried before. Sunday, the last day of the challenge was dedicated to hydration. Many different mineral waters were offered on the water trolley, as well as still water infused with fresh fruit and sparkling water with different flavors. 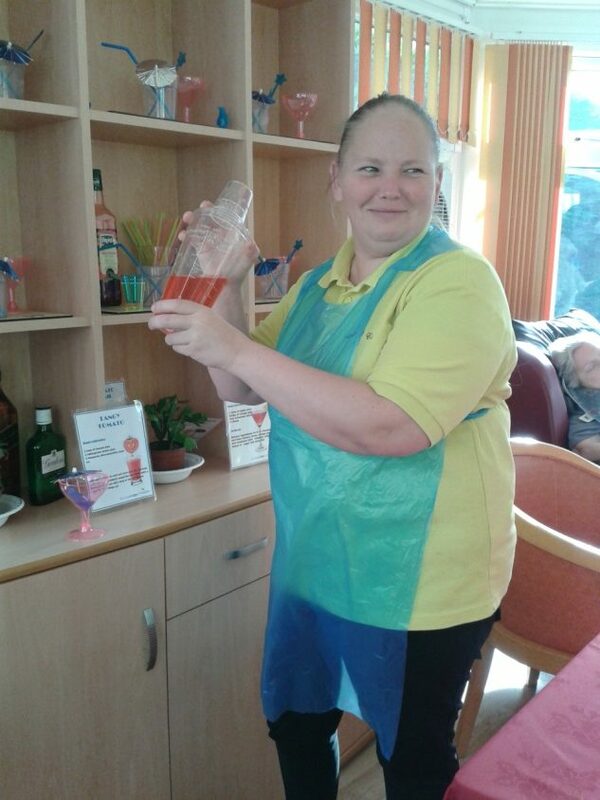 We at Birchy Hill Care Home are very fortunate being well on the way to the Whole Home Approach. All Staff is involved in daily activities, not only activity and care staff delivers meaningful activities, no, there is the chef, the cleaner, the maintenance guy, the laundry lady and the staff trainer, not to forget the manager and the administrator, who have a little chat or a walk, help with bus trips, offer 1-2-1 support, help at mealtimes or just make a cuppa for the residents. Now we even brought it to the next level. Following a 3 days training by Prof. Joyce Simard in autumn 2016, Birchy Hill Care Home is now able to offer Namaste Care to their residents in regular sessions, with all staff being involved. Namaste Care is a program designed to improve the quality of life for people with advanced dementia. Namaste, a Hindu term, meaning “to honor the spirit within” was selected to describe a program that brings honor to people who can no longer tell us who they are and can’t care for themselves without assistance. The residents are snuggled into cozy blankets, relaxing music is played, the room is darkened and scented with lavender oil, Kaleidoscopic shapes are projected to the walls and ceiling. 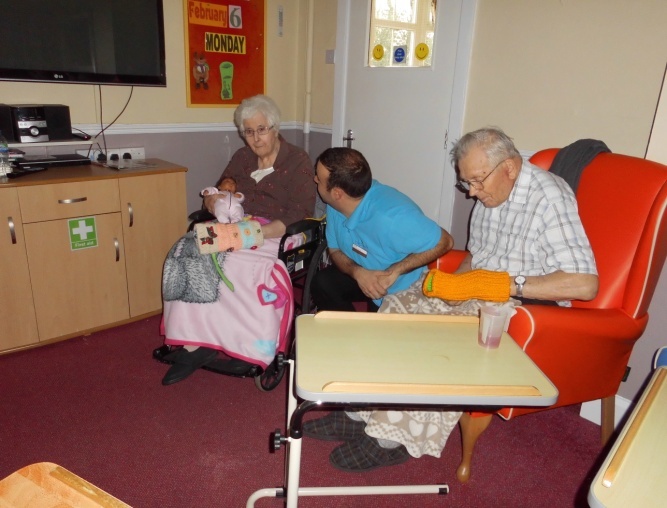 All staff that can spare some minutes is involved in giving hand massages, offering drinks, using feathers, silk and wool to pamper the residents. All senses are activated by this wonderful Body-Spirit-Mind experience. The residents thoroughly enjoyed the first session and we can’t wait for the next one. HOW SHE COULD PLAY THE UKULELE………………….